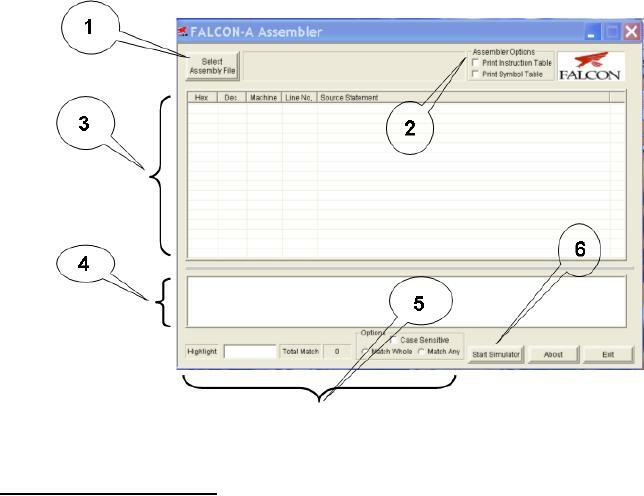 assembler and the FALCON-A simulator. It runs under Windows XP. to run the FALCON-A Simulator. structure at the implementation level. The Symbol Table is used by the 2nd-pass module. program contained in the assembly file. I/O port values and memory contents as the instructions execute. 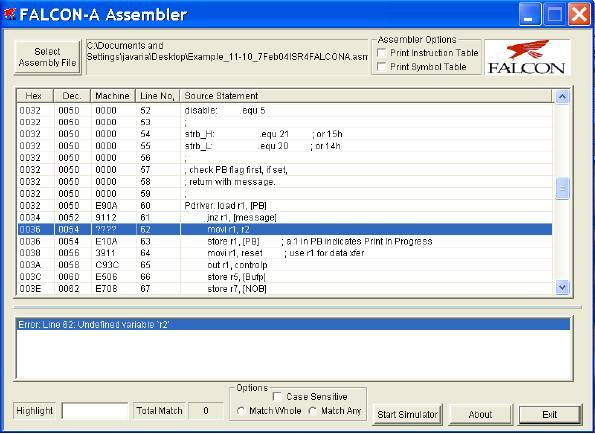 a FALCON-A assembly file and open it for processing by the assembler. Table includes variables, addresses and labels with their respective values. the end of the list file. when the 2nd-pass is completed. yellow color. It also indicates the total number of matches found. 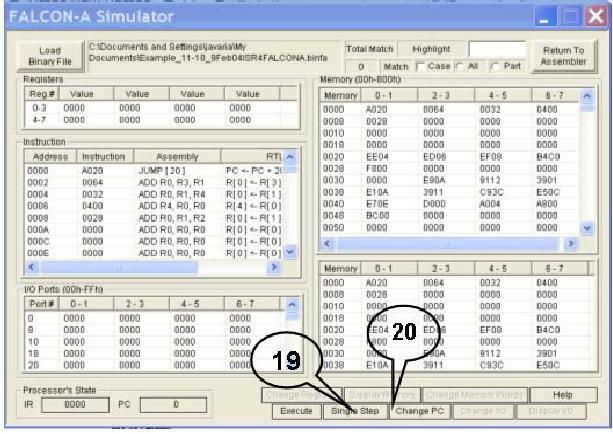 the simulator all the register, constants (if any) and memory values are set. different registers before, during and after execution. code and the instruction type. once the instruction has successfully executed. Instruction Register and the Program Counter while the program executes. yellow color. It also indicates the total number of matches. The following is a description of the options available on the button panel labeled as "18"
Single Step: "Single Step" lets the user execute the program, one instruction at a time. specifies a different PC value using the Change PC option (explained below). 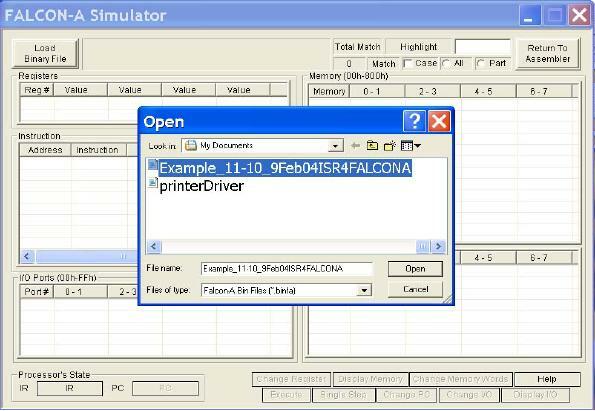 Change PC: This option lets the user change the value of PC (Program Counter). points. The value in the PC must be an even address. breakpoint values. It also has the option to set a limit on the time for execution. frame specified by the user. value present in a particular register. by the user indicates the input type and source. stating from the index specified. binary file with an extension .binfa will be generated by FALSIM. source file. 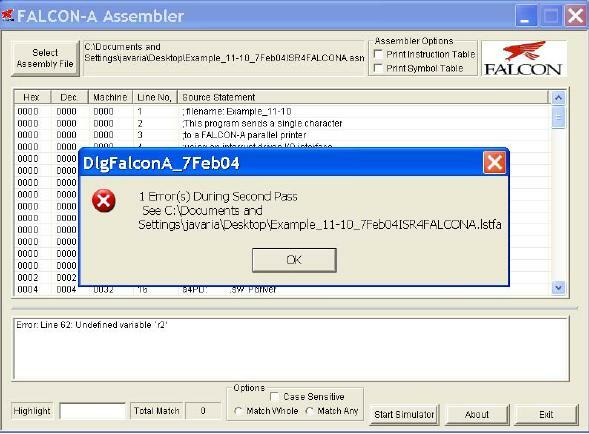 The FALSIM assembler ignores any text after the semicolon. assigned to variables when they are defined. should have a colon (:) after it. force code at a particular address in the memory. instruction in the ISR at this location. generate an error at the jump [first] instruction. placed after the procedures and should be terminated with the iret instruction. directive in the source file. Any address between 4 and 14 can be used in place of the displacement field in load or store instructions. Recall that the displacement field is just 5 bits in the instruction word. field in the instruction word. FALSIM icon. 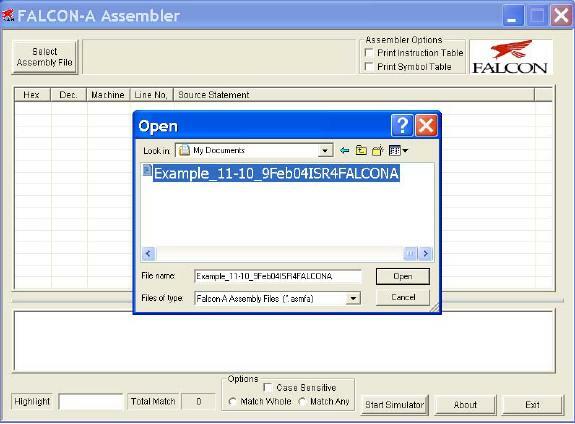 This will display the assembler window, as shown in the Figure 1.
the instruction table will not be generated in the list (.lstfa) file. box as shown in the Figure 2. · Select the path and file containing the source program that is to be assembled. 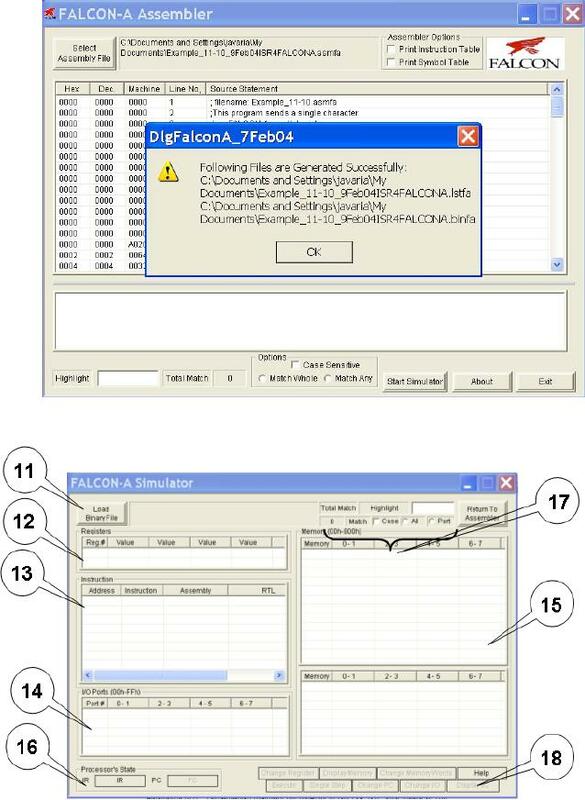 messages in two separate panes, as shown in Figure 3.
open the dialog box shown in Figure 6.
also possible to open the file by double clicking on the file name in the "Open"
located in the memory by the operating system (called re-locatable code). Subsequent memory locations contain constants defined in the program. address of the first instruction in the main program (i.e., the value of main). registers. Clicking on the single step button twice, executes these two instructions. first instruction in the printer driver. program. In case of the dummy calling program, this is the halt instruction. be selected from there as well. panes of the simulation window at each step. environment (working registers) before the ISR change them. instruction, which is the next instruction after the int instruction. instruction is ready for execution. instruction,which stores an error code of ­1 in r1. stores the number in 16-bits after sign-extension. The result will be the same in both cases. overcome this problem, use movi r2, x followed by load r1, [r2]. by the .sw directive. The value of a should be less than 15.
large values of the target address. Bit setting and clearing can be done using the logical (and, or, not, etc) instructions. divisor is a power of 2.